Dame Vivienne Westwood has blasted the British government for treating people like "guinea pigs" when it comes to fracking. 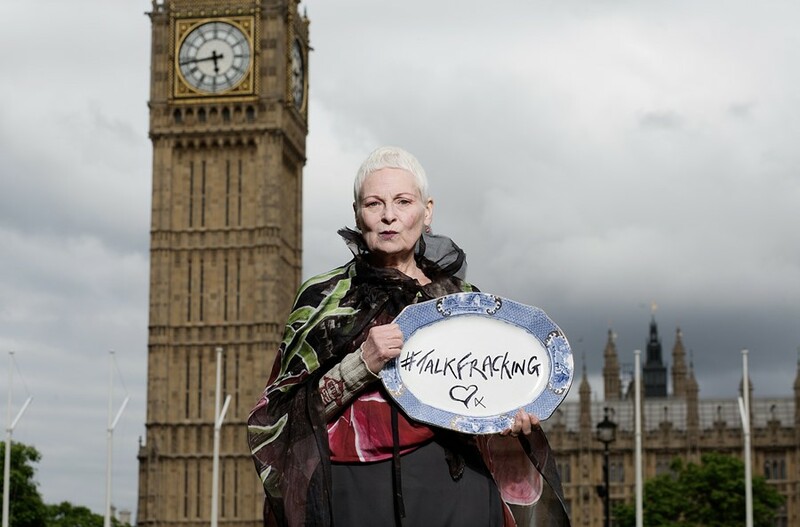 The doyenne of protest fashion said that the controversial method of shale gas extraction should be put on hold in the UK until more is known about its health and environmental effects. The 73-year-old designer is leading the #TalkFracking campaign, which has spent the last week touring the country to debate the issue. Despite repeated invitations, government ministers and representatives from fracking companies like Cuadrilla have declined to show up. "This is the most important decision the English people will ever have to make now," Dame Vivienne said ahead of a Westminster debate on Monday night. "Even though the government have been putting out this propaganda as to why we need this fracking, they weren’t prepared to talk to anybody about it." "What I would really like to get over to the public is the idea that this experiment that they want to conduct on the UK guinea pig, that it will take between 10 and 15 years before they even know if it is economically viable." Fracking involves pumping liquid at high pressure deep underground to split shale rock and release shale gas. Over the past year, protests have erupted in areas like Balcombe as anti-fracking activists and local residents clash with the growing industry. In June, the government has confirmed its plan to allow fracking companies to drill under people's homes without permission – although, as Dame Vivienne points out, politicians seem curiously reluctant to defend the policy in person. In fact, one of the only politicians who expressed interest in joining the debate were UKIP, although Westwood wasn't standing for it. "We won't get them involved," she told Dazed. "The only thing they’ve given people is an enemy. Farage has always got his pint of beer, hasn’t he – they’re trying to make people think they’re one of them. But they’re not going to look after our interests if they head down the same road that’s taken us into disaster. They’re no different from the other parties."